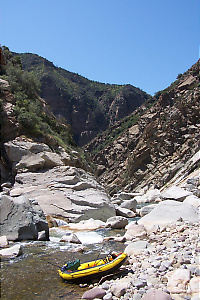 This run starts with easy gradient and becomes an expert run where it turns south and cuts thru the Sespe rock formation. 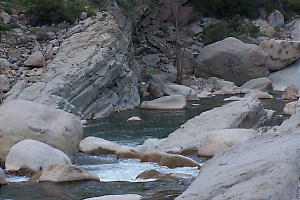 The wilderness is as deep or deeper than anything encountered in the Sierra, so make sure to bring extra food and adequate first aid supplies. In dry years, the ideal flow window comes very early, but in wet (El Niño) years, good flows could last into May. Low flows are reported to be easier, so do not start this adventure when rainy weather is predicted. 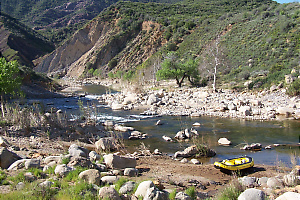 I have kayaked Sespe Creek twice: once in 1991 and again in 1996. 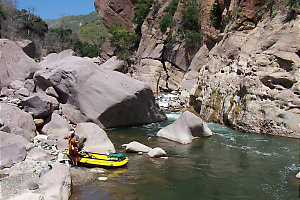 I have always wanted to try rafting it. 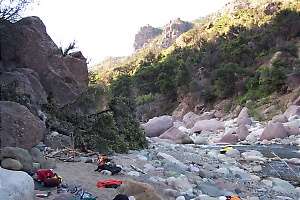 On April 13-16th 2005, Brian Baker and I ran what is most likely the first complete raft descent of Sespe Creek. We used a 10' SOTAR during our self-supported trip. Flow was about 100 cfs at the put-in and 400 cfs at the take-out. More water would have been welcome, but not much more, especially down in the canyon where there are some must-catch eddies. Toward the end of the run is a seemingly endless portage around, over and under giant house sized boulders. It was a major undertaking with a raft but well worth the work. The Sespe ranks right up there with any river in the Sierras in both difficulty and beauty. For more photos and a day-by-day guide, see Sespe Creek by Preston Holmes.